Creativity has never been more important in business than it is today. The demand for innovation and new ideas is constant. With the Industrial Economy giving way to what some pundits are calling the “Creative Economy”, companies, and the employees within them, need to change in order to survive and prosper. They need to think outside the box, right? Not so fast. When someone says to “think outside the box”, what are they saying? They’re saying forget the rules. Ignore the past. Don’t be constrained by the realities of your situation. Think blue sky, no restraints, no bad ideas. Creative freedom. This is, frankly, ridiculous. And a gigantic waste of time. Because blue skies, creative freedom and “outside the box” thinking is overrated. You need to think inside the box – recognizing the rules, the realities, the details and the constraints that define your situation and what success is – in order to deliver innovation and useful creativity. And, generally, the more constraints, the better. You have to define the box. 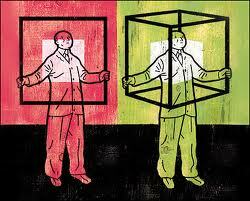 You can’t think inside or outside the box without clearly defining the box. What are the details, the realities, the prerequisites? What’s worked in the past, what hasn’t? What do you need to achieve? As Bob Sutton points out, the first step in creating anything new is knowing as much as possible about the old stuff. And don’t look at constraints or realities as bad things. Look at them as the traction for your creativity. And the fact is that, generally, the old stuff worked for good reason – so the box is there for a reason. So, again in the words of Sutton, “straying from proven ways is rarely a creative act…; rather, it is a sign of poor training, lack of attention, incompetence, or stupidity.” After all, as Darwinism would predict, most new ideas don’t work – and most old ones (the ones that are still around, at least) tend to be successful. So stray outside the box at your peril. Creativity demands the constraints of the box. It may seem like a paradox, but you can’t do any constructive “out of the box” thinking without a darn good box. In fact, that out of the box thinking is really inside the box – the box that, as mentioned, defines the problem and the realities and details of your needs. I’ve heard the quote “give me the freedom of a tightly defined brief” – that until you have a very tightly defined problem, you can’t effectively ideate solutions (and I’ve written on the need to define your problem first). Want an example? Try coming up with a short story right now. It’s not easy, right? Now, try coming up with a story about a policeman and a thief, who are brothers, separated at birth, who meet again later in life. Much easier this time, isn’t it? Details and constraints help. And any creative person will tell you that too much freedom is not helpful. Take John Pierce, seminal innovator from Bell Labs. When he was first brought in, he was given free rein to pursue anything. To him, it was like being cast adrift without a compass. “Too much freedom is horrible”, he said (from Leading Blog). 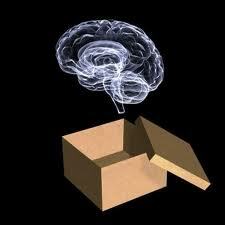 Nearly all breakthrough innovations evolve from existing ideas – i.e inside the box. It’s exceptionally rare that innovation and new ideas come from a lightning bolt flash of new, out of the blue thinking. Instead, they generally come from either incremental improvement upon existing ideas, or as a combination of known elements in a new way. Creativity tends to be iterative – building off of ideas and concepts that are most assuredly already inside the box. As brilliant as innovators and creative thinkers may be, they’re only “standing on the shoulders of giants”, as Isaac Newton said, describing this iterative and additive nature of knowledge. Old or existing ideas aren’t intrinsically dumb, outdated, and in need of being thought outside of. Just because certain boxes are old doesn’t make them worthless. Being creative requires a deep understanding, and respect for, the old ways. As I mentioned before, in order to create something new you have to know a lot about the old. And creativity is largely about seeing old things in new ways – or combining existing things into something new. This requires knowledge of and respect for existing ideas. The key is to find a way to create a view of the box that is different from the way you currently think. Creativity needs to be useful. No matter how creative an idea is, if it needs to be useful. As Thomas Edison said, “the value of an idea lies in using it.” To be useful, it needs to be relevant to and be additive to what is already known. Creativity without usefulness is, well, useless. So, what do you think? Should we start championing the idea of “thinking inside the box with our teams? This is very refreshing. Thanks. what a perspective, clutter breaking and makes you want to go back and take up things.. (one’s not executed rightfully) to get them to an actionable take off. 1: ‘Define The Issue’ (and I mean REALLY define it – I’m a big believer in the word ‘really’). But everything stems from working within the box as you say. Thanks for the kinds words, Martin. Keep on coming back! Michael – Your post prompted me to go back and re-read “Blue Ocean Strategy” – a great book that speaks to the very points you articulated. Thanks for the stimulation. Thanks, Toby. I think it’s time I re-read that book, as well. You can send me an email at michaelbaer1@gmail.com. Thanks, Toby. I did not realize I try to think this way until my friend sent this article to me and mentioned it reminded her of the way I think. Your thinking made me realize how important it all is. I was part of training a group on our how to design within our Brand structure. I passed out your article and mentioned that this is my favorite article. I hoped it would inspire them because when people first think of designing inside structure, they think boring, will the creative look the same? Well lets look at some of the strongest brand we know. To me they have the most powerful creative and never boring. I have worked for many in-house agencies and how many times did upper management hire and outside agency to create out of the box creative with full freedom, did not even need a logo. Then the project comes in-house to execute and no one understands what happened it does not look as exciting. We could of created similar creative but it would be unless like you said so perfectly. Thanks for the comments, Debbie. I appreciate your thoughts and kind words! Is Annoyance A Media Strategy?